Smoke rises from the shattered wreckage of the large ABC department store. 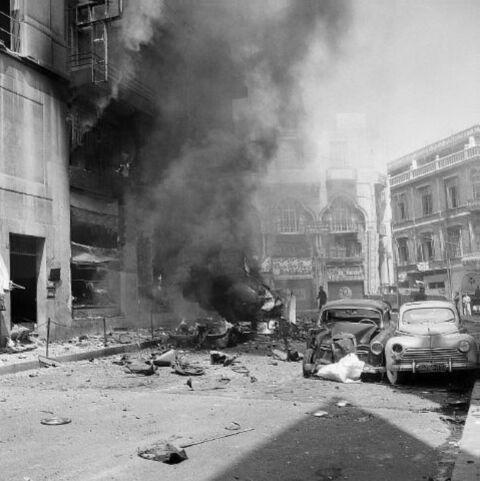 Scores of people were injured when a rebel bomb exploded in the crowded store. July 8, 1958. Lebanon was always a mailbox. In 48 hours of chaos, hundreds of Syrians die due to a chemical attack, a Palestinian group launches rockets on Israel‘s Naharaya, Israel responds by raiding a Palestinian camp on Lebanese territory, while later that day two car bombs target mosques in Tripoli. A week earlier, another bomb (courtesy of a Syrian opposition group) rocks the southern suburb of Beirut, just after a week of a Hezbollah-Israel clash that was followed by days of silence. For a republic where the political status quo is still the same since March, things are moving a little too fast on the security side. As you can see from the small intro above, Lebanon is practically non-existent in Lebanon. It’s all about Syrians, Israelis and Palestinians. The only thing in common between every one of them is the Lebanese soil, where they apparently like to send each other messages. Imagine for a while that Samir Geagea bombarded Larnaca. As a response, the Cypriote air force starts shelling Michel Aoun’s residence. Now that I’ve clearly showed how irrelevant that move is, I would like to point out something here: Abdallah Azzam Brigades (AAB) – An Al-Qaida affiliated group that carries the name of Abdallah Azzam, a.k.a. The Father Of Global Jihad – launched two rockets on an Israeli town, and in response, the Israeli Army attacks the Popular Front for the Liberation of Palestine – General Command (PFLP-GC) in Nehmeh south of Beirut. Once you realize that the AAB and the PFLP-GC are ideological threats and political foes – For the AAB is an islamist right-wing Al-Qaida affiliated anti-Syrian(regime) group, while the PFLP-GC is a secular leftist pro-regime Palestinian party – you understand that the Israeli attack is more like bombing Iran for something Saudi Arabia did, on Jordanian Soil (or simply shelling Aoun’s residence for something Geagea did, you get the point). For the IDF, they were targeted by “Global Jihad Terrorists” (Check the IDF spokesman’s tweet here), so they responded on “terrorists”. The Syrians and Israelis are communicating. When Chemical weapons are used en plein Damas while UN inspectors were in the area, you understand from Bashar Al-Assad’s show of force that the red lines (Chemical Weapons) the west is drawing mean nothing to him, and that the anti-regime countries couldn’t care less about the Syrian opposition and are not ready to intervene, no matter what. The answer didn’t take a lot of time to come: The Israelis could’ve hit something other than the PFLP-GC, something a bit more related to the AAB. But they chose the Palestinian group that has the closest ties to the regime in Damascus for a reason: They want to deliver a message to Al-Assad, that he is not as free to act as he thinks he is. If they wanted to hit back on the Islamist perpetrators of the attacks, or on the Lebanese (strictly speaking), they would’ve hit Hamas or Hezbollah, but they wanted the message to cross the Lebanese border. Lebanon is not only the mailbox linking the Syrians and Israelis, but also the one linking the Syrian themselves. The opposition and the regime, along with their Lebanese allies, are sending each other messages in an accelerating rhythm. No one is making a sufficient remarkable breakthrough on the ground in Syria, which made both sides in a need of a psychological warfare in every possible location. Perhaps intimidating the population, targeting its beliefs, and demoralizing it might eventually lead to questioning the power of both sides among their supporters, and helping to shatter the military front from the opposite side. A month earlier, graffitis in the Christian areas were calling for federalism. After the Rouais bombing in the southern suburbs, Hezbollah’s zone became similar to an independent canton as the party increased its security measures. In yesterday’s press conference, Tripoli politicians started warning of establishing self-security (الامن الذاتي) in the city. In fact, with time passing by and the worsening of Syrian crisis, with no government, with a non-elected parliament, with an outgoing president, with a commander of the army whose presence depends on a ministerial decree, with fear and suspicion spreading everywhere, and with the loss of control and the falling apart of the state’s institutions, the main side effect of the Syrian spillover is no longer the refugees problem, or the shelling of Hermel and Arsal, but rather a slow and steady disintegration of the Lebanese entity and the creation of small federal/security zones that might at any moment clash with each other and drag Lebanon to another civil war. Posted in 14 March Alliance, 8 March Alliance, Lebanese Politics, Politics on August 24, 2013 by Ramez Dagher.